Service Costs > How Much Does Shot Blasting Cost? How Much Does Shot Blasting Cost? Shot blasting is the method of cleaning a concrete surface with small steel balls using high velocity. This action often involves a gun or a ride-on-rolling blasting machine, which removes contamination and soft concrete to reveal a clear surface for better bonding. The concrete dust is collected by a strong dust collection system. This is a cost-effective and environmentally-friendly method for preparing surfaces such as steel, concrete, and asphalt. It also makes the surface ready at the soonest time possible for the application of overlays and coatings, reducing the drying time and expensive disposal connected with other surface preparation methods. Shot blasting creates the highest bonding quality of any kind of surface preparation method. How much does shot blasting cost per square foot? On average, the costs vary based on the location, size of the surface, the length of time and the difficulty of work. When hiring a professional, plan on spending anywhere from $100 to $175 per hour or up to $2 to $3 per square foot from the quotes we extracted online. The cost of shot blasting is the combined total sum of materials, labor, cleanup, disposal, and equipment costs spent to complete the work. To get an exact quote, consider getting multiple quotes for free from local licensed contractors in your area at HomeAdvisor.com. Keep in mind that most contractors will want a minimum of at least $500 to begin a job. If the surface area you need to be cleaned is considered too large, other equipment may be needed such as a lift or crane. The rental fees for these equipment will make the cost higher. There are various types of shot blasting machines, ranging from small handheld guns to riding lawnmower size machines to enormous blast booths huge enough to hold a tractor trailer. In spite of differences in size or shape, most of them have the same composition. A basic shot blasting setup features an air compressor, a blast cabinet, a shot blaster gun, and a funnel-shaped dispenser to deliver the shot to the gun. The average contractor can cover up to 80,000 square feet a day. Shot blasting is quite specialized: it prevents the use of harmful, non-eco friendly chemicals and results to a more desirable concrete surface. Shot blasting can help increase the surface area, clean it and dry it immediately, making it ready to accept coatings within minutes. This is an effective method for taking out rust, paint, and some other surface flaws from the concrete surface. This shot blast equipment and the kind of shot that is used adequately prepares the surface for powder coating or paint. Shot blasting may carry some health hazards, so safety is a concern. Make sure that equipment has an enclosed cabinet to protect you from contaminations of the debris and dust. If not, use a dust mask equipped with a respirator. Inhaling debris from blasting may result in lung disease, for example. If you are using a shot blasting gun, it must just be pointed at the area where it is to be used, and wearing goggles is required as protection. Shot blasting needs some skill and knowledge, and may often need a professional to do the job well. If possible, leave shot blasting job to the professionals since it has risks both ways — health risks and the risk of you failing to do the proper procedure. This method is commonly used for concrete flooring, steel deck cleaning, epoxy removal, concrete floor profiling, surface cleaning, contaminant build-up removal, rubber build-up removal, texturing and profile concrete. If you have some experience with shot blasting, you can do the job yourself, but just be aware of the risks and consequences. Shot blasting is already cost effective since it’s known to be 1/20th of the cost of repairing or replacing. 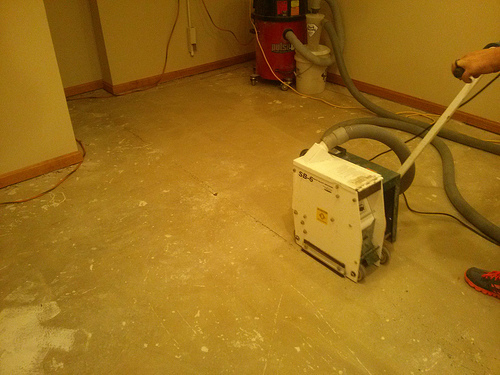 A diamond grinder can often do the same job at a fraction of the cost.